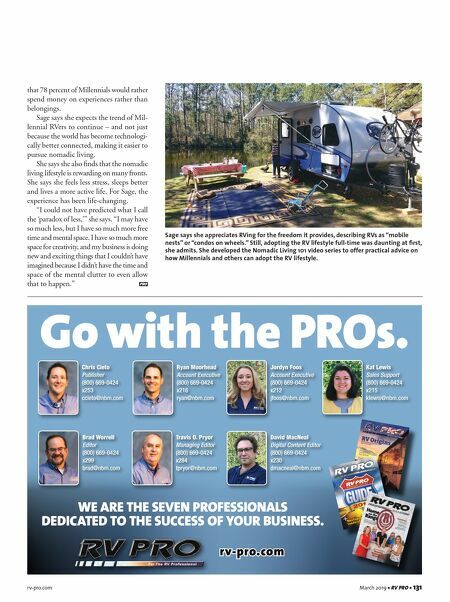 130 • RV PRO • March 2019 rv-pro.com B U S I N E S S For instance, Sage and Oliver love to salsa dance, but they also enjoy spending time in nature. In their case, a 20-foot travel trailer matched with an SUV gives them the versatility they need, according to Sage. She and Oliver can parallel park in the city when a night of salsa dancing calls, or they can tow the trailer up a mountain without a problem. An Opportunity for Dealerships While Sage offers her Nomadic Living 101 video series directly to indi- viduals, she also is looking to partner with dealerships to sell it. It only makes sense that dealers choose to sell the video series given that, as more Millen- nials continue to purchase RVs, they are sometimes coming to dealerships with questions about the nomadic RV life- style that the staffs there aren't necessarily equipped to handle, according to Sage. By offering the video series, a dealer- ship can gain an upsell while providing a value-added solution, Sage says. To sell Nomadic Living 101, a dealer- ship buys a bundle of access codes to the course in 10, 25 or 50 packs. The packs come at different price points, although the 50 pack offers the best value because dealers pay less per access code, according to Sage. A 50 pack costs $100 per access code, totaling to a $5,000 investment. If a dealership charges just $300 per access code, which is Sage's lowest rec- ommended price, the dealership will make a $10,000 profit once it sells out of Nomadic Living 101 codes. In her case, Sage sells the course directly to Mil- lennials for $747 per access code, but she believes in empowering the dealerships to make the decision on pricing. "We let the dealership choose the price of each access code and how to set up commissions for the salespeople," she says. "That's all up to them because they know what works in their market best." In the event RVers walk away from the course with additional questions, Sage guarantees that she will personally provide answers. Dealerships don't have to worry about handling those inquiries and can feel assured that she will take care of their customers, she says. Providing a resource on how to pursue the RV lifestyle on an extended basis can help a dealership stand out from its competitors, according to Sage. That, in turn, can help make customers feel more confident about their decision. If a dealership can help these new customers, they will not only be more likely to follow through on the sale, but they also will be more likely to view the dealership as a valuable resource that helped make their new lifestyle a reality, according to Sage. " RV d e a l e r s h i p s t h a t a re b e s t equipped to serve this pop- ulation are the ones that will be most effective in capitalizing on the trend," she says. "Dealerships have been accustomed to mostly speaking to the retiree pop- ulation, but this is a dif- ferent demographic with different needs." Given that Millennials are in their 20s and 30s, serving this market also gives dealerships an oppor- tunity for developing even longer-term customer rela- tionships than their cur- rent retiree customer base, Sage says. While relation- ship-based sales are helpful in serving customers across generations, she says that Millennials especially have a repu- tation for valuing businesses that offer a more human connection as opposed to faceless, impersonal businesses. "You get in and you make connec- tions with people who thrive on per- sonal support and relationships, and you're going to get repeat customers," she says. "People get new RVs every few years, so if you form these long-term relationships now, they'll be back if you take care of them." As some Millennials find success with their new nomadic lifestyle, they will share their experiences with friends, particularly through social media and review sites, Sage says. So, a dealership that empowers its customers to pursue this new lifestyle could stand out as a valuable partner, she adds. 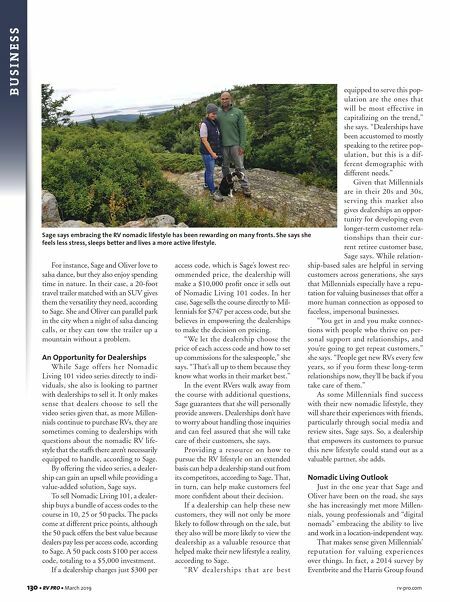 Nomadic Living Outlook Just in the one year that Sage and Oliver have been on the road, she says she has increasingly met more Millen- nials, young professionals and "digital nomads" embracing the ability to live and work in a location-independent way. That makes sense given Millennials' reputation for valuing experiences over things. In fact, a 2014 survey by Eventbrite and the Harris Group found Sage says embracing the RV nomadic lifestyle has been rewarding on many fronts. She says she feels less stress, sleeps better and lives a more active lifestyle.